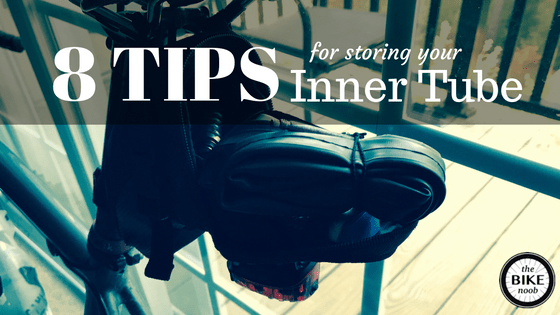 How do you store your spare inner tube for rides? The one thing that you want to be in good shape when you need it is your spare tube. I just store mine in my bike pouch wrapped in a tie wrap. Or sometimes in the original box that the tube came in. The thing about storing your tube in your bike pouch is that it’s sitting in there with pieces of metal and plastic for months, traveling thousands of miles and the millions of small back and forth motions that go along with that. I learned a hard lesson about this when moving to college one year, and we piled stuff in the back of the truck. A bicycle pedal was propped up against the back of a piece of furniture (thankfully the back), and by the time we reached school just 80 miles later, the pedal had worn a hole clear through the back of the furniture. A similar thing may be happening inside your bike pouch. How long has your inner tube been sitting in your bike pouch wearing away with the miles? We can do some things to make sure that tube is ready for action when it’s most needed. Wrap it in something protective, like an old sock. Our own Ray does this. I’d use something very lightweight, like a dress sock, or even a woman’s nylon sock. Store it in a ziplock bag with baby or talcum powder. The talcum powder is a lubricant and will help prevent any of those rubbing issues. Plus, powder on the tube will make it much easier to get it into the tire when you’re changing a flat. Store it in the original box. Tube manufacturers have already figured out how to package the tube in a very small space, and have conveniently put it in a box for you. Just leave it in there. You’ll gain a little bulk that way, but the box will crush down a bit if it needs to. This is a great way to see that wear that can happen over the miles as the box’s decoration will get worn away. Check it out after a season. Don’t wrap your tube in a rubber band. Sometimes different rubbers react with each other, and if the rubber band you’re using reacts with your tube, it could weaken the inner tube, causing it to crack. Do wrap your tube in something rubber-safe, like a tie-wrap. Store your tube with the cap on the valve. The pointy part of a Presta valve can work itself into the wrong place and work a hole into your tube. Don’t store your bike near a heat source, like in direct sunlight, or near a heater. Heat will cause tubes to dry and become brittle. Take the tube out once in a while. Inspect it for damage and even inflate it to check for leaks. Some good practices and prevention will pay off when it matters. On the side of the road. I don’t ride at night often, but when I do, my lights are always dead. Or I don’t have them with me. But if integrated with my helmet, I think I’d remember to keep it charged, and I’d certainly not be without that. What a great concept, automatic brake lights, always on blinking rear and front lights, turn signals… yeah how about keeping your hands on the bars while signaling a turn in traffic? nice. Sometimes the simplest ideas are the best. Unfortunately, it’s a year away. I have no doubt this one will get funded. Check it out on Kickstarter. The early bird offers of $85 for your own helmet are still available. UPDATE after a day, this kickstarter is funded, and then some. The early bird offer is gone, but there are others. Hurry! I haven’t gotten in a lot of biking lately. Not only have I been caught up in the end of the semester crunch at the university, but my road bike has been acting up. A week ago, I found myself unable to shift from the small chainring to the big one. I had to abandon a ride and get home, although that was the same ride where I discovered the broken spoke. I finally got the bike into the shop on Wednesday, where the mechanic listened to my shifting complaint and examined the bike. The chain is okay, since it’s fairly new. But he didn’t like the look of the big chainring. He thought he could get one into the shop the next day. But that didn’t happen, and I didn’t pick up the bike until Friday afternoon, after getting home from some Christmas shopping. Because of the lateness of the afternoon, I was unable to get the bike out for a shakedown cruise. Saturday was mountain biking day, as we headed for a mountain bike park more than 60 miles from home. The ride was great fun, and although my friend Maggie and I took the “beginner” ride with an experienced leader, we agreed it provided plenty of challenges for us, and was just the ticket. We figured that Sunday would be a recovery ride day on the road bikes. On the way over to the meetup place, I noticed that shifting to the big ring wasn’t as smooth as I’d like, but at least it worked. I liked the sound of a silent bike again. We broke away from the main group several miles into the ride, and pointed ourselves toward the Veloway to do some slow laps. But as I pedaled along, I felt a snap. The shift cable for the rear cassette broke away from the shifter. I was stuck in the smallest rear cog, and while I could pedal, it wasn’t going to be easy. I parted ways with Maggie and limped home. After parking the bike in the garage, and showering and changing, I went back out to get a picture of the problem. And there it was — the rear tire had gone flat. First flat on the tire since I bought it last summer. Fixing the flat will be no problem, but the bike goes back to the mechanic this week — and I hope the shift cable can be repaired without me having to buy a whole new shifter. In the meantime, I’m back to mountain biking for awhile.